A lot of things we could ask Msgr. Semeraro, looking from his point of view. We could ask if he knows that the Society of St. Pius X has been built with the approval of the Bishop of Fribourg in 1970; that the Holy See has granted the decree of praise in 1971; if you know that the house of the Society of Albano, with its semi-public oratory for amministrarvi the sacraments, was canonically erected by decree of his predecessor, Msgr. Raphael Macario February 22, 1974 (ref. 140/74). We might also ask how do you reconcile its prohibitions with the pronouncements of the Holy See , who answered the Commission Ecclesia Dei on 18 January 2003 said that it is possible to satisfy the obligation of Sunday Mass “attending a Mass celebrated by a priest of the Society of St. Pius X “; or how do you think you can “break communion with the Church” going to Mass from the Society of St. Pius X, when the Holy See does not consider even more out of the communion of the Bishops of the same fraternity; or if you think that the alleged irregularities canonical equate to a rupture of communion. We could even ask him why he, the bishop, to organize an ecumenical vigil in the Cathedral (18 January 2014) to pray with people who certainly are not “in communion with the Catholic Church” as an evangelical pastor and an Orthodox bishop (in which Orthodox 2009 gave the church of San Francesco in Genzano, built by our forefathers for Catholic worship), while the faithful can not pray with other Catholics at the Mass of the fraternity. We might ask why the openness of the diocese is so broad as to include the “First Forum of Christian homosexual”, held in the House of Somascan Fathers on 26-28 March, but [closed to] those who remain tied to the tradition of the Catholic Church. The Fraternity founded his own ministry to the faithful on the need to combat the errors against the Roman Catholic faith that are widespread in the Church by the Bishops : the one just mentioned ecumenical indifference, so you can give credit to all religions as if they were all ways of salvation, breaking down to the fact the First Commandment of God, until the adoption of a liturgy that moves away from the expression of the dogmas of the Roman Church to become semi-Protestant and irreverent. Errors that are driving more and more, as we have seen in the last Synod, where, under the appearances of mercy, they discussed the possibility of amending the Sixth Commandment and give the facts indissolubility of Christian marriage. The state of grave necessity General due to the widespread distribution of errors against the faith on the part of the ecclesiastical hierarchy, canonically founded the right and duty of every faithful priest to give the sacraments and an authentic Catholic education to anyone who requests it. All those who wish to receive the sacraments as the Church has always managed, receive an authentic catechesis for their children, an adult education, spiritual direction and a comfort to the sick will always be welcome. “…We could even ask him why he, the bishop, to organize an ecumenical vigil in the Cathedral (18 January 2014) to pray with people who certainly are not “in communion with the Catholic Church” as an evangelical pastor and an Orthodox bishop (in which Orthodox 2009 gave the church of San Francesco in Genzano, built by our forefathers for Catholic worship), while the faithful can not pray with other Catholics at the Mass of the fraternity. Game, set and match to the SSPX … again. No one will convince me that either of these calumnious bishops is acting in good faith. They’re a couple of con men posing as shepherds of the flock, this latter one even posing as a Latin Mass-friendly bishop while up to his eyes in ecumenism and inter-religious dialogue. Such is life for the orthodox Catholic under Francis, the Pope of mercy! I hope this doesn’t come across the wrong way and I start to sound schismatic, but I’m having trouble praying for Pope Francis’ intentions. I don’t know if we should be praying for this Pope’s intentions. An SSPX priest says to pray for the Pope’s OBJECTIVE intentions. Whatever that means! Interesting point. For example his second intention for this month is “That young seminarians and religious may have wise and well-formed mentors”. Now that intention is, in itself, perfectly sound. But I suspect that his understanding of “wise and well-formed mentors” may not concur with yours or mine! Olaf, surely to pray for the Pope’s intentions is to take for granted that they will be suitable for a pope! I think you’ve hit the nail on the head. I’ve often thought about this custom of “praying for the Pope’s intentions” in recent years when we’ve had popes with apparently crazy or misguided if not bad intentions (Assisi springs to mind) and the only conclusion I can reach is that we pray for those intentions which a sound/good pope would and should hold. Intentions in harmony with papal authority. That is, intentions which promote the true good of the Church and seek the social kingship of Christ. I see others are discussing the view of a priest that we pray for the Pope’s “objective” intentions – frankly that doesn’t make sense to me. It seems clear that Pope Francis’s objective intentions are not sound – objectively he appears to be of the opinion that there is no need to belong to the Catholic Church for salvation, for example. Anyway, I no longer pray for the Pope’s intentions but for great graces for this Pope to see the damage he is doing (“intentionally” or otherwise – pun intended!) and for him to consecrate Russia. Pray for him even though we object to him being Pope. Or is that a case of “subjectively” we object to him being pope but “objectively” we accept his election? I can well understand your dilemma. The problem is in identifying anything in the Pope’s intentions, as they have manifested themselves since his election, that presents even a semblance of Catholicity. It’s a difficult one, that’s for sure. Still, I guess we have to take the SSPX priest’s advice given to Olaf, which is to pray for the Pope’s OBJECTIVE intentions. I think what the priest meant by that was the intentions that we presume he must have in his heart as Supreme Pontiff of the Church. In fact, this Pope, more than any other in history, needs more, not less prayers!! I couldn’t agree more and I pray for him every day. I’ve no problem praying for him but I do have problems with praying for his intentions. I really do wonder if the man has any Catholic intentions. Still, I suppose we should presume the best and pray for the intentions that are Catholic. At the very least we should pray that the Pope has Catholic intentions in the first place. My SSPX Priests says to pray for the Pope’s Catholic intentions… whatever those are, anyway. Yes, I know exactly what you mean. I deal with it by praying for the Pope’s RIGHT intentions, i.e. those that are in accord with the will of God and don’t contradict faith or morals in any way. I see the Argentine Bishop is using Pope Benedict’s Motu Proprio to justify what he is doing, like Bishop Semeraro. I think Pope Benedict ought to speak out now to complain about this manipulation of his words. That may yet happen, perhaps in the guise of a clarification from Archbishop Ganswein. As Fraser says in Dad’s Army: They’re mad, mad”. That sums it up! Or, they’re just plain bad! Yes Helen, he also said “We’re doomed, all doomed…”!! Therese, that’s hilarious and made me lol! Let’s just hope no Scots bishop takes it into his head to do the same thing. We’re on red alert, though, just in case… Let ’em try! When the Edinburgh chapel opened the then Archbishop O’Brian (ever heard of him?) sent out a letter stating that attendance there did not fulfil the Sunday Obligation. The majority of parishes never printed it in their bulletins with only two doing so. A friend of mine attended one of those parishes and told his P.P. that it was a load of rubbish. “Oh I know that” said the priest. “Then why did you print it” asked my friend. “Because the Archbishop told me to” came the feeble reply. These Bishops will have a sore time come judgement day. As Priests they must know that their judgement will be all the more severe. If they could grasp that solemn reality then they would be very different bishops indeed, that’s for sure. Alas, such wise fear is often obscured in the mind of the ambitious man. The more I think about this the more I think it is being orchestrated from the Vatican, probably by Pope Francis himself or with his knowledge. It seems too much of a coincidence that this is happening first in Italy, then in Argentina, especially when put alongside what happened to the Franciscans of the Immaculate. As I understand it, a bishop is empowered by the Church sui iuris to impose ferendae sententiae excommunications, so are those who disobey him excommunicated or not, and if not, why and how not? Please and thank you O most wise bloggers. Thank you, Confitebor Domino, that fully answers my question. I’m wildly jealous. You never say that to me! Interesting that these Bishops consider the only “enemies” of the Church to be true Catholics. They are angry that we are not really “excommunicated” so they think they will take care of business by imposing an “excommunication” unjustly, with no reason whatsoever, other than pure hatred for the True Catholic Faith, plain and simple. I think that’s a very fair and accurate analysis. Spot, as they say, ON! I haven’t heard about the “latent seed” theory before, and find it interesting that these ‘elements of great value’ present in Christian communities outside the Church are regarded as ‘seeds’ in Modernist evolutionary theory. Long before Vatican II and its problematic constitutions the Catholic faithful were taught that other Christian sects contained ‘elements of great value’,(or truths) but these were understood to be not ‘evolutionary’ but simply ‘leftovers’ from the Catholic faith from which the Protestants et al had seceded – sort of ‘preserved fruits’ rather than seeds. Similarly, whereas it is now claimed heretically by Modernists that the Holy Ghost works through false religions, it was understood that graces did indeed come to adherents of false religions, but such graces came directly from the ‘treasury of the Church’ – and how depleted must that ‘treasury’ be, now that contemplatives, holy priests, devout lay Catholics, etc. etc. number so few as compared to the days before Vat. II. The “latent seed” theory was first raised by St. Pius X in his Encyclical against the Modernists. It is essentially a twisting by the Modernists of that Gospel reference to the latent seed that grows into a great tree, which, of course, has always been understood to reflect the organic development over time of the Catholic religion. What the Modernists contend today, however, is that every man in fact has the latent seed of faith in his subconscious, which may be brought to the fore by a particular life experience, or when reason and science can’t answer his deeper questions about existence and purpose. Pope Francis, in Lumen Fidei calls it a “primordial” seed, indicating that he believes it to be a faculty inherent in the nature of man from the Creation of the world. In other words, it’s gnosticism disguised as Catholic teaching. At any rate, this latent seed, once activated by such an experience of the sort just mentioned, is subsequently analysed by the mind in conjunction with what Pope Francis calls “the religious memory,” such as one finds recorded in the history of the Old and New Testament, or in the records of another “faith tradition.” The result of this process is a manifestation of faith in one of any number of belief systems that acknowledge the transcendence of man. For Catholics, the resultant belief is in one who was the most perfect man who ever lived on earth, who was also divine, Jesus Christ. Although it’s not stated with absolute clarity, the inference is that in Our Lord we have the example par excellence of the man whose latent seed of faith was so far evolved as to render him divine, a true Son of God, which is what the rest of us aspire to. So, for the Modernists, the Catholic religion is the most evolved of all the various belief systems, but not to the exclusion or detriment of lesser-evolved manifestations of faith in the divine, which are likewise considered to be green shoots of that latent seed of faith common to all men from the foundation of the world. So no condemnations of religious error, only dialogue with one’s fellow pilgrims as we all travel our pilgrim way to the ‘Omega Point,’ which is the point in time when all men will have evolved to become divine!! In the meantime, doctrine, dogma, liturgical practice, etc., are all subject to the same evolutionary forces as are propelling man to his divine destiny. These cannot remain static, but must change to accommodate changing circumstances in the world and man’s developing enlightenment. That’s why, since Vatican II, absolutely everything has been changed. There is not a single aspect of Catholic belief and practice that has been left untouched by the Modernist innovators. The subject is a little more complicated than I have expressed here, but it provides at least a general overview of the Modernist agenda. No wonder St. Pius X called it “the synthesis of all heresies”. I’ve always been taught that it refers to the seed of faith which grows in each one of us (if properly nourished). I’ve never heard your explanation before, ever. You needn’t have “stopped short.” There is a personal, internal understanding of the parable of the mustard seed, as you say. But it is also applicable in a more general sense to the visible, external Church. The following was written by Mgr. Ronald Knox. It explains the parable of the mustard seed in the sense I intended as external and visible. “…The two parables of the Mustard Seed and the Leaven are a pair, and are obviously meant to be a pair. Our Lord seems to have been fond of this method; partly, I suppose, on the principle that if you give two illustrations of a moral which you want to rub in, you can make sure of people seeing the real point, instead of going off on side issues; any speaker will tell you that. Partly, perhaps, because his audiences were mixed, and an illustration which would appeal to one set of them would not appeal to others. There were men there and women; and so you find him asking, “What man is there among you that hath a hundred sheep, and if he lose one of them … “, and then, “Or what woman is there having ten groats, if she lose one of them … “—he will suit his lesson to both classes. And so here; the kingdom of heaven is like a mustard seed which a man took and planted in his field; or again it is like the leaven which a Woman took and hid in three measures of meal. It is part of our Lord’s great courtesy, that he will make allowances for everyone. In this video link Michael Matt and Christopher Ferrara discuss this so called called excommunication by Bishop Semeraro. In the aftermath of what happened to the Fransicans of the Immaculate, is the Vatican so fixated upon the SSPX? Thanks Theresa Rose – I look forward to viewing the Remnant video later. Those diocesan bishops’ “excommunications” are beyond parody and one big yawn! That is true. However, for the truly uninformed and the malicious, they allow the myth of the “schismatic SSPX” to be perpetuated. Not to mention the scandal of ecumenism and normalisation (if not promotion) of homosexuality by these same shameless bishops to continue unquestioned by the same uninformed and malicious “useful idiots”. The logic of these attacks on the SSPX, which are essentially an attack on the Traditional Latin Mass (as well as doctrine/morals, of course) is that we must not honour the saints and martyrs who treasured this same Mass to the point of giving their lives in defence of it. Maybe we will soon see the entire host of martyrs, especially those who refused to go along with the Reformation Communion Services, quietly dropped from the calendar? These Bishops only make fools of themselves; for anyone caring to look into matters for themselves it quickly becomes obvious what rubbish they talk – and this discovery is quite dispiriting for people, that sections of the Catholic hierarchy are duplicitous liars. When you look at the seemingly inexhaustible legions of homosexuals, pederasts, frauds, hypocrites, incompetents and thieves who are allowed to run riot in the Church, it is clear that no competent or worthwhile Bishop would invest time in hounding and undermining remaining groups of faithful Catholics. I am pleased that the SSPX have robustly defended themselves, but how depressing it must be for them to be under scheming attack from their “Brothers” in the clergy. (That is, whenever their attackers can drag themselves way from the latest ecumenical break-dancing ‘service’). Section 3 is particularly useful, using real life examples and Ecclesia Dei pronouncements. Of course, most of us here will already be aware of this information and its implications, but it is useful to see it grouped together for the benefit of others and to expose the lies of Bishops. Father Tony Flannery, apostate troublemaker and destroyer of Irish Catholicism, is currently on a major speaking tour of US Cities where he espouses his nonsense for the edification of his fellow non-Catholics. He is a major threat to the faith, having repeatedly undermined Catholic teaching (without recanting) and is so suspended. Where are the warnings about Flannery from the Bishops? Why do they not warn people off Flannery, instead of going after people for the crime of practicing the Catholic Faith? (Fortunately, Flannery and, based on a picture I saw, his audiences are in the twilight of life, but that does not excuse the Bishops from their negligence in ignoring his destructive behaviour). Superb post. Absolutely spot on, and then some! Thanks for the reminder about the Irish dissenter, Fr Tony Flannery. I can’t help wondering however, if, as they did with Fr Sean Fagan – another Irish dissenter – the Vatican will lift Fr Flannery’s suspension. That, of course, would only serve to underline your observations about one rule for “traditional” (i.e. fully believing) Catholics and another for the Protestantised Vatican II breed. It should be noted that the SSPX was founded by Archbishop Lefebvre to form priests, particularly in response to the developing post-conciliar crisis occurring in seminaries throughout the world. Thus its specific mission (as can be seen stated in its Statutes) was not to fight against Modernism as the article author states above, though this is a necessary aspect of fidelity to the Catholic Faith and thus Tradition. As you say yourself, fighting Modernism is a necessary aspect of fidelity to the Catholic Faith and Tradition. So, I’m afraid I really don’t get your point. I found this short history of the SSPX and it is clear that Archbishop Lefebvre was concerned about modernism, ecumenism etc. Priests could not be properly formed if these things were being inculcated. I haven’t seen the Statutes but I wonder if you are misinterpreting them? I see the clarification you are making and the reason for it. The article author represents the SSPX District of Italy. It is therefore incumbent upon him to state correctly the exact juridical basis upon which the SSPX was established and approved by the Bishop of Friborg in 1970, which is to say, the formation of holy priests via exclusive application of the Church’s Traditional methods of formation. It is vitally important that this legal distinction be made lest credence be added to the falsehoods that subsequently resulted in the unjust suppression of the SSPX, and lest the more extreme element within Tradition itself attempts to distort the Archbishop’s holy intentions into something akin to a crusade against the Church’s lawful authorities. Fighting Modernism is, as you say, a necessary aspect of fidelity to the Catholic Faith and Tradition, but it was cited a little out of context in the article. Thank you for pointing that out. I’m very glad to read the Society’s response to this latest nonsense. To be honest, it’s not a moment too soon: love of Truth and the Church, and the peace of souls demand it. Heretics, schismatics, infidels, antichrists, perverts, atheists, agnostics and just about every nut in the forest is to be feted and cosseted, and confirmed in their errors and separation from the Church, while those Catholics who believe and worship as Catholics have done always and everywhere are to be treated as some sort of outcasts. So be it. Maybe we should regard it as a badge of honour. The “New” version of mercy is unashamedly operating under a glaring double standard. The false charge of “schism” and the non-“excommunications” of 1988 have been addressed time after time, on this blog and elsewhere. As for the matter in hand, Catholics can’t just be declared “excommunicate”; unless of course the novus ordoites propose going back to the ways of some of those Renaissance Popes. One of them, I believe, threatened his former concubine with excommunication if she did not return to her sins. “You can’t be kicked out of the Church for being a Catholic”. In these days of diabolical disorientation they are worthy of constant repetition. I think we can call on Saint Thomas Aquinas to bring a bit of sanity to bear. “A tyrannical law, through not being according to reason, is not a law, absolutely speaking, but rather a perversion of law.” – Saint Thomas Aquinas, Summa Theologica, I, II, q.92, a.1, ad 4. Like others here, my first reaction to these two stories was to think that the two prelates are having a laugh. Whatever: this was just one more example of the Conciliar madness and one for the connoisseurs of twisted humour. On further reflection though, in all likelihood this represents a dark incoming cloud on the horizon. 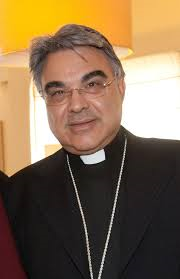 Bishop Semeraro is reportedly very close to Pope Francis and has been given a secretarial role with the Pope’s chosen “cabinet” of consultative Cardinals, the Group of 8, or nine if the Secretary of State is included. The “conservative” Argentine Bishop Sarlinga has, on the other hand, reportedly been an adversary of the former Cardinal Bergoglio. One of the Remnant’s writers, Chris Jackson I think, is due the credit for making a rather apt comparison to the ridiculously unjust treatment of the Society in general. He compared the Society to emergency services dashing towards a fire or some other disaster, only to be stopped and detained at the side of the road for having an out of date tax disc or license. It’s a simple image that is worth recalling. The last eighteen months have been nothing if not an ever louder free promotion with lights on, of the urgent need for a complete restoration of Tradition, if such was even needed. The human element of the Church is presenting to the faithful and to the world, on a daily basis, a grotesque, evil parody of the Bride of Christ, and the One, Holy, Catholic and Apostolic Faith. It is also very noticeable that for well over a year, the full-time professional, neo Catholic lay apologists have become increasingly obsessed with vilifying Catholics faithful to Tradition. That is a rather good sign, in a roundabout way, if you ask me. They must be getting worried. The Modernist revolution is self-liquidating. There are no heirs in the emptying seminaries and monasteries. At some stage, at a time of God’s choosing and through the intercession of Our Lady, the madness will come to end and whatever the limited numbers of the remnant faithful to Tradition, the restoration will begin. And that shortage of time appears to be one of the inescapable and logical explanations of the accelerating rampage of the revolution. Again, I’m glad that the Society has offered a robust defence. May we read a lot more such statements in what are most definitely pivotal days in the history of the Church. What exactly will the cost in souls be if Tradition is not defended? What exactly is going to happen if Catholics who recognize the cancer in the Church submit to simply staying silently on the reservation, provided they have the true Mass? What will Catholics a hundred, two hundred years from now be saying about this generation? It might also be a good time for Catholics to read Archbishop Lefebvre’s Declaration to his priests and seminarians, written 40 years ago this month. On the matter of praying for the Pope’s intentions, reading the following 2002 article by Father Nicholas Mary has helped me a great deal, particularly the part towards the end which deals specifically with the question of intentions. I have to say that, but for reading this excellent article, I would have the very same struggles as other bloggers. I was pleased to see the above point made in Fr Nicholas Mary’s article because that is what I meant when I said ” surely to pray for the Pope’s intentions is to take for granted that they will be suitable for a pope!” I think confusion came when some bloggers referred to “the Pope’s objective intentions” when what Fr Nicholas Mary is saying is “we are praying for something objective” – not the same thing IMHO. Thanks for another marvellous post, BTW. I think – put as simply as a simple gal can put it – it’s a case of NOT praying for Pope Francis’s personal intentions if they are contrary to the good intentions any Catholic would expect from any pope. We’re really all saying the same thing here, as far as I can see. It seems to be very clear from what Pope Francis is saying and doing, that his personal intentions do not include everything (some might say “anything”) on the “objective” list given by Fr Nicholas Mary, Certainly, his version of the contents of that list appears to differ markedly from the traditional definition of each, so – as I said above – my prayer for Pope Francis is that he responds to the grace of his office, which will take him, inexorably, to right thinking about his papal duties. So, yes, Father Nicholas Mary is correct in that we must pray for the Pope. but there’s nothing in the Ten Commandments or Canon Law which requires us to use the form of words, “for the Pope’s intentions” when his intentions would appear to be to dismantle what little is left of the Faith! I exaggerate (slightly) to make my point. In summary, let’s all pray for Pope Francis. Like we have never prayed for anyone or anything before. That covers all bases! Pope Francis’s intentions certainly do not match the list, in Margaret Mary’s post, if this Rorate Caeli report is anything to go by. This is really shocking. I feel I must conclude by suggesting that we do all pray very hard for Pope Francis! (Similar content as the LMS briefing, but good to see the objections going out under the global banner, over and above the English LMS). That is very interesting, the fact that even those groups who are not affiliated or even necessarily well disposed towards the SSPX have come out in criticism of these two Bishops. They are to be commended for their honesty and openness. I recommend the video link posted by Theresa Rose on 5 Nov. Thanks for this – 30 minutes well spent. Thank you for that recommendation – I will view the video now.